This home page contains educational, computer-related, cultural, judaica, and miscellaneous material. The following link leads to my research page at http://herz-fischler.ca. A sixty page introduction to using Octave for solving linear and polynomial equations, statistics, data analysis, an introduction to programming, graphing, "tossing coins on a computer" (simulation), etc. A special feature (section 01) is "A sample Octave session" which allows the student to rapidly learn the essential features (diaries, variables ...) of Octave. Suggested excercises are included in each section and Octave sessions and programs are commented. The Guide provides a more advanced guide to Octave (Octave accepts Matlab code). The Guide may be freely distributed for educational purposes. "Doing Math[ematic]s Algorithmically in the Age of the Computer" An article that appeared in the Gazette of the Ontario Association of Mathematics Educators advocating the introduction of a more modern approach to mathematics education via an algorithmic approach, combined with the use of a true coding language such as Octave. "Pick a number, any number" A mathematical "trick" to impress your class or audience. To see why it works see sections 06A and 15A of An Introduction to Octave for High School and University Students above. Genealogy and Mathematics An application of a binary labeling system to genealogy. Simple mathematics shows why your ancestors lost a person on the way to you! Do It Yourself Tex A set of forms and macro files for pure XeTex. These permit the importing of images, marginal and footnotes, colour, typesetting for right to left languages etc. The entire package (9.0 MB) can be downloaded. Both the Tex and PDF files are included. With Graphviz one describes nodes and the relationships---if there are any---between them (via "edges") and the software does the rest. What is the favourite food of mathematicians? 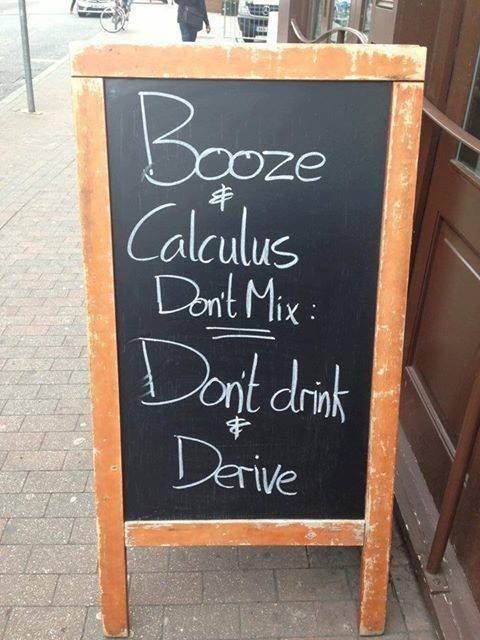 Drinking and calculus do not mix! Advanced sommeliers may wish to see my papers on ''mixing sequences''.